"Triangulation Buffers Exceeded or Polygon self crossing"
Anybody who knows me, knows that I have the dynamic memory settings in Maptek Vulcan turned up way past the larger setting and into truly enormous custom levels (my personal, custom settings can be found at this link). Anything less than that and this triangulation wouldn't load (hence the desire to relimit it). I also knew that the polygon didn't have problems because it was a simple rectangle that I had just made. Luckily for me, there is an external executable in Vulcan that makes relimiting large triangulations possible. The executable trirelimit.exe will relimit triangulations to a given, closed polygon in your database and return the portion of the original triangulation that is either internal or external to the polygon. To use the trirelimit.exe tool, open the Maptek Vulcan t-shell by clicking on the Vulcan start icon in the bottom right corner of the workbench and selecting: TC Shell (tcsh). Enter Database: This is the database name where the limiting polygon is found. Vulcan requires the project prefix to be specified by the user. The extension (dgd.isis) is optional. Enter Layer Name: This is the layer name containing the limiting polygon. Vulcan now accepts longer layer names so your layer can have more than ten characters but still needs to be 40 characters or less. Enter Object Name: This is the name (or object name) of the limiting polygon. This is an old executable and will require an object name that is ten characters or less. The polygon being referenced should be a closed polygon. (I)nclusive or (E)xclusive: Type the letter 'i' to retain the portion of the triangulation inside the polygon or 'e' to retain the portion of the triangulation outside the polygon. Enter Input Triangulation Name: The name of the original triangulation. This name must not have any spaces in it if you are using the one line input method (see below). The input triangulation will not be modified. Enter Output Triangulation Name: The name of the resulting triangulation. The output triangulation name may not have any spaces in it if you are using the one line input method (see below) . Press enter after the last entry and the executable will get to work. 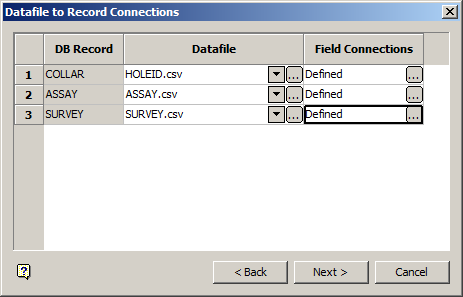 Alternatively, you may enter all the input data in one line with a space between entries. That's it. The resulting triangulation will appear in the working directory and should be smaller than the original. Let me know how this works for you. Hi mate! i always fallow you publications, you are doing a great contribution. 1- Is possible use a executable for multiboolean? i know that i can use some boolean executables, but i don't see any for multiboolean. 2- how can i decode files with client clava encription? 1) I don't think there is an external executable for multiboolean. Most of the newer functions don't have corresponding executables. This seems to be something that Maptek has moved away from. 2) I don't know of any way to decode a clava file. The 'c' in clava stands for compiled, so this file is in binary format. Sometimes the Maptek offices use this format because the script is using some more advanced panel options. Other times I think they just use it to keep you from modifying the code. For a while there the Maptek corporate policy was to only send out scripts in compiled format. I think that on many levels this defeats the purpose of having a scripted language. Sorry I couldn't be of more help. Let me know if you have any more questions I can give negative answers to :).